A "campus in a high-rise" fosters a high-tech collaborative learning environment. Udemy (the Academy of You) educates more than 10 million students through online courses, empowering everyday experts to share their knowledge with the world. 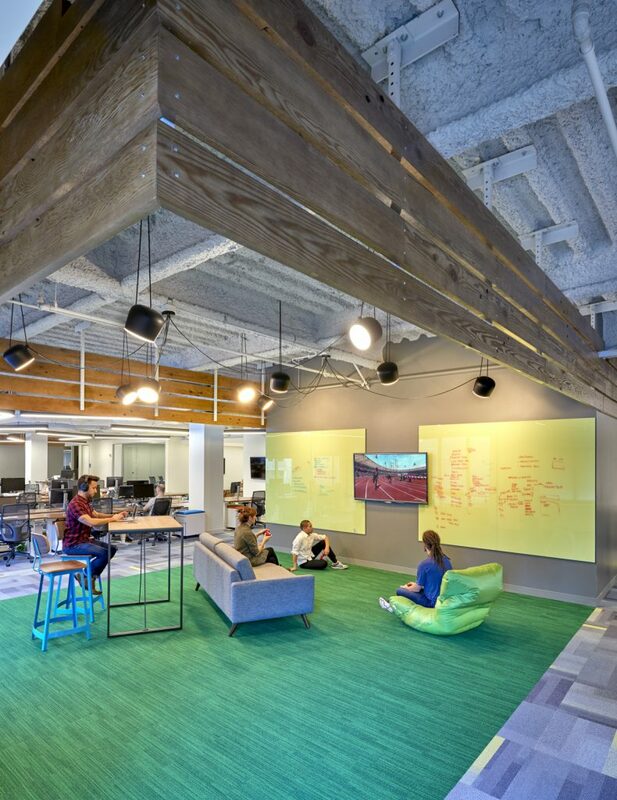 RMW’s design for the company’s 40,000-square-foot offices in San Francisco reflects this mission by blending the spirit of a schoolhouse with the energy of a high-tech start-up. Polished concrete, salvaged wood, clean lines, and primary colors define the space. 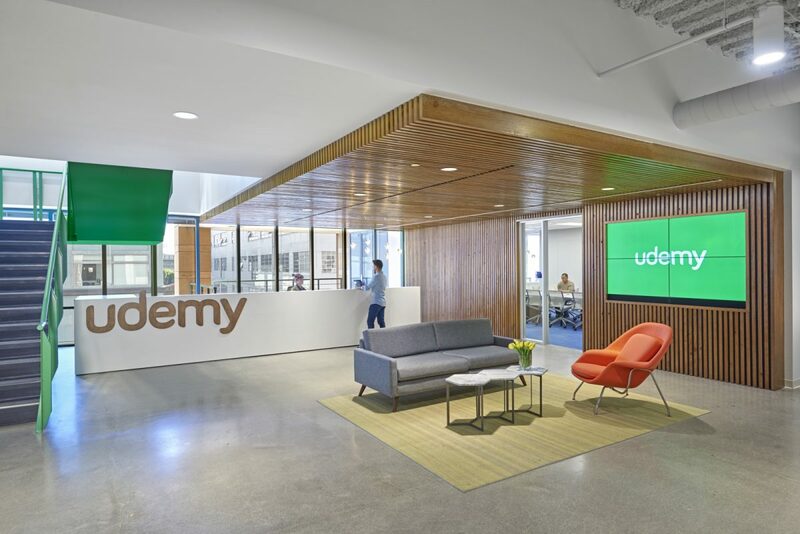 Programmed specifically to support Udemy’s culture of “marketplace” learning, the offices feature an all-hands area with a stage, tables, screens, and bleachers that can accommodate Udemy’s 200-plus employees. 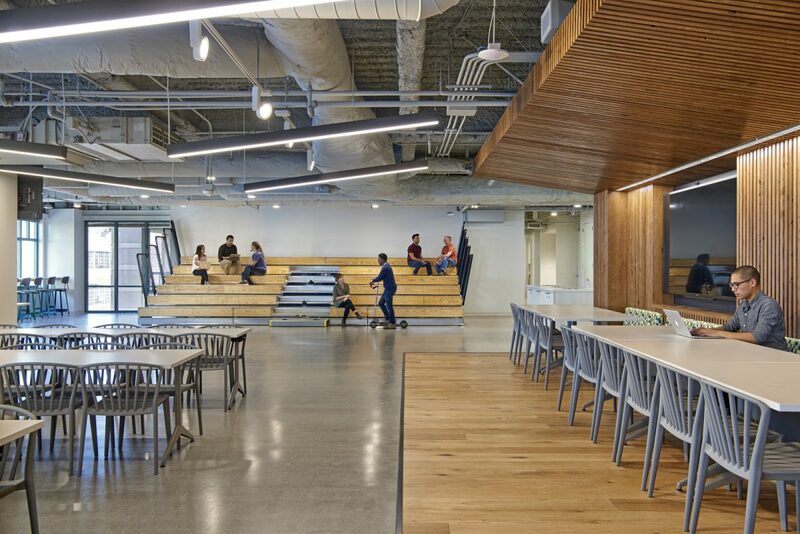 The angled wood ceiling element is designed so that it is intimate enough for daily use as a casual café setting or as a proscenium-like backdrop for all-hands meetings. 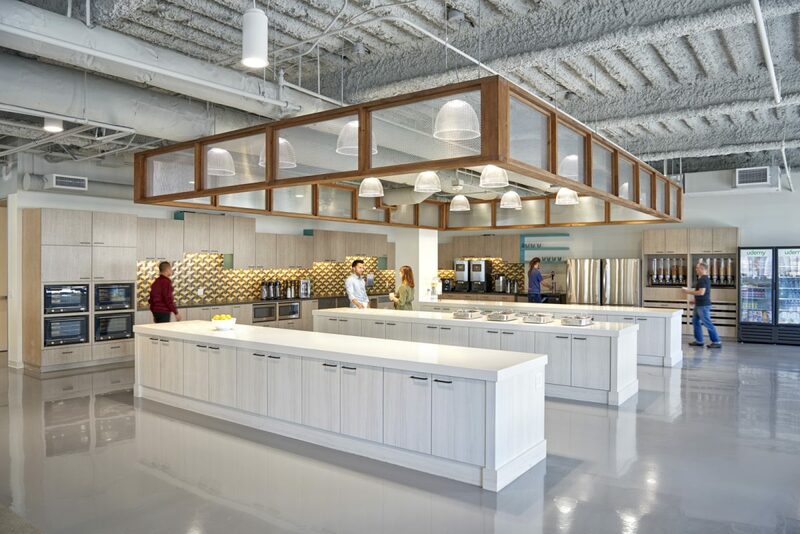 Interaction over meals is core to Udemy’s culture, so an adjacent kitchen has heated counter tops to keep catered food warm, as well as a massive snack pantry. As befits a universal education firm, the office environment is open and flexible, with sit-stand benching supported by enclosed and open collaborative spaces of various sizes. The open office is broken down into small neighborhoods, creating communities within the larger population. Neighborhoods are identified by collaborative hubs that are minimal in their architectural design but big on character. Neutral finishes provide the perfect background for showcasing ideas and information. Colored accent furniture is mobile and reconfigurable, allowing for ultimate flexibility. Ideas take center stage at the heart of the building. 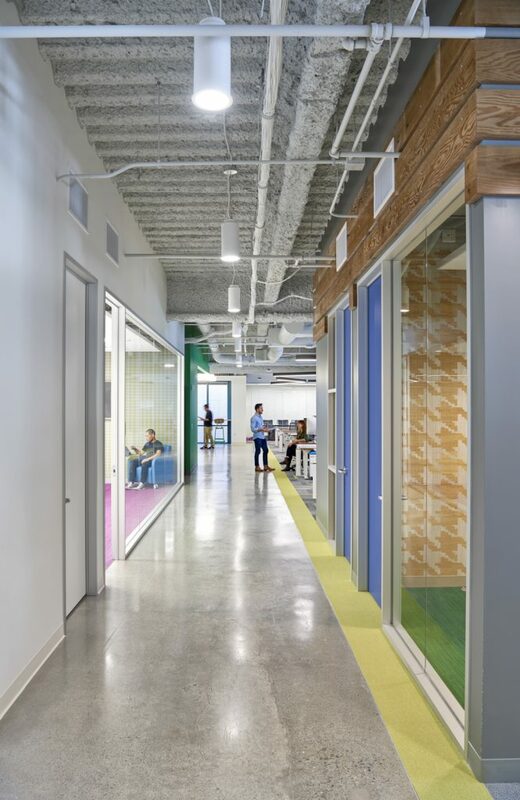 Meeting spaces are located on circulation paths to increase opportunities for chance encounters and cross-collaboration, but door openings are strategically placed to reduce noise — an important factor considering the large amount of virtual collaboration Udemy’s employees do. 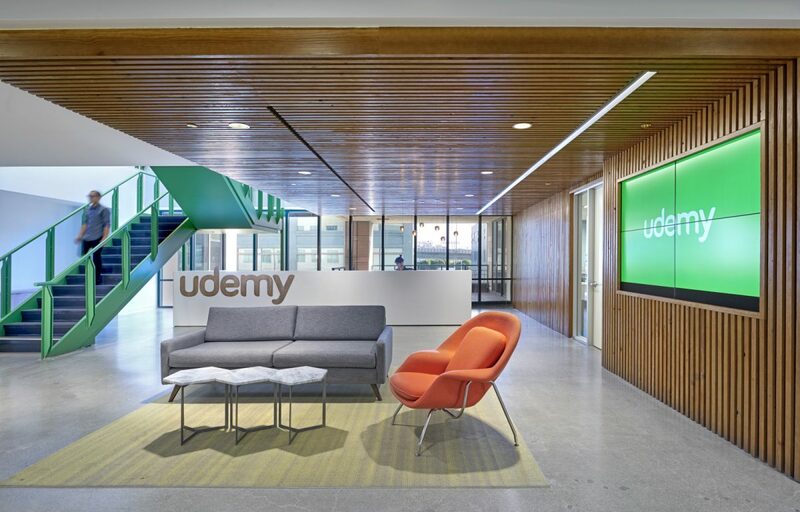 With its variety of open, flexible zones, and paths that open onto daylight, Udemy’s offices function like a higher-ed campus in a high-rise. 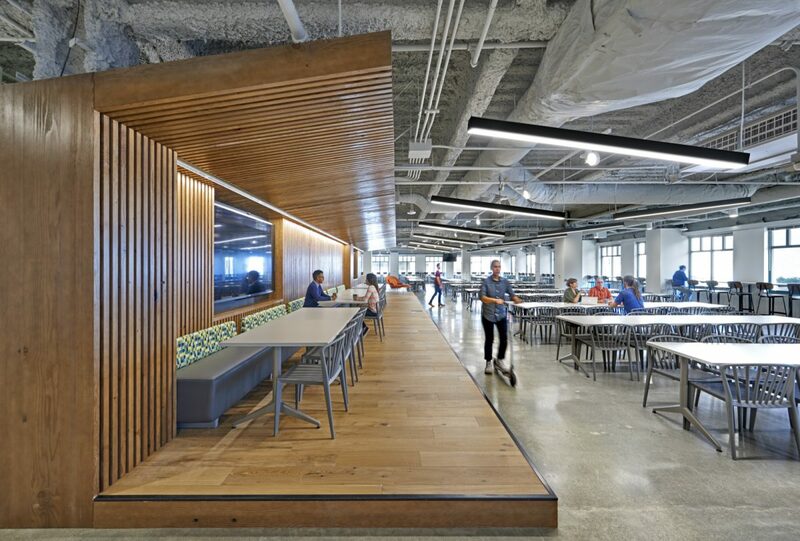 The wood used in the reception area is salvaged from a lumber mill in Fort Bragg, symbolizing Udemy’s regional connection to the San Francisco Bay Area. Architectural elements like doors and sidelights are salvaged, adding to the diversity of design and authentic spirit of the space.